Congratulations to our beloved Appy, who is the newest QuiBidder of the Week! 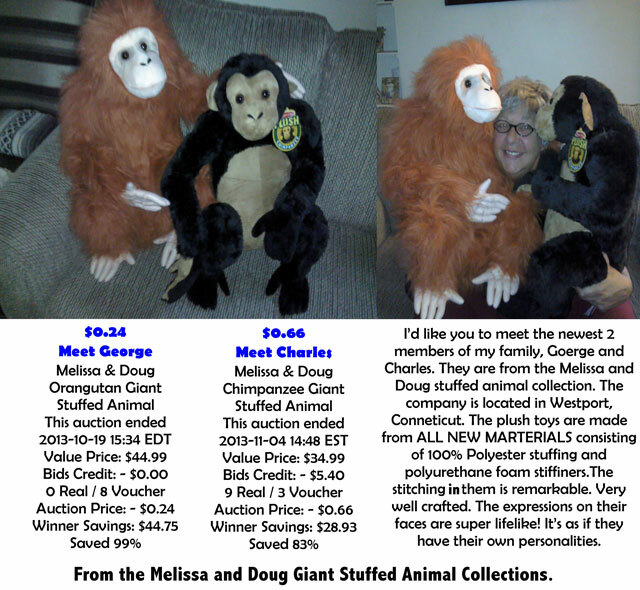 Keep reading to learn a little more about her experiences with QuiBids, like the awesome deals she received on two stuffed Melissa & Doug monkeys (refer to image). Do you want to be featured on our blog as the next QuiBidder of the Week? If your story is chosen, you’ll receive a $50 gift card of your choice! Click here to submit your entry along with a supplemental photo of you with your wins. Have you ever purchased something from the QuiBids Store? No I have not. However, I do use the QuiBids store as a search feature for upcoming merchandise I might be interested in. It is an easier way for me to locate new merchandise that is supplied to us. I go directly to the category of interests and browse from there. Congrats again to Appy! Do you want to be the next QuiBidder of the Week to have your QuiBids story featured on the blog? If your story is chosen, you’ll receive a $50 gift card of your choice! Click here to submit your entry. See what’s up for auction now on QuiBids.